As part of the team’s long term goal to reach greater heights, the recovery Subteam is focusing its efforts on developing a CO2 deployment system for Project Raziel. This system will allow for more reliable separation at higher altitudes than what could be achieved by a traditional pyrotechnic system. The CO2 system will be housed in the Avionics bay. Tubing will direct the released CO2 into the recovery tube and separate the rocket between the Recovery and Payload sections. One of Recovery’s greatest challenges so far has been sourcing a valve to interface with our CO2 tank. Colin P. ’18 has developed a low-cost, custom valve. 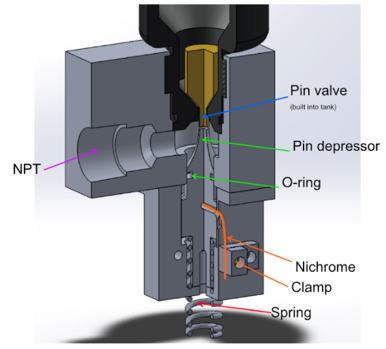 During the separation event a nichrome wire will heat up, break, and allow a spring to push the pin depressor into the canister’s pin valve. Another one of Recovery’s challenges this year has been developing a mechanism to prevent the main parachute from being pulled out by the drogue at apogee. 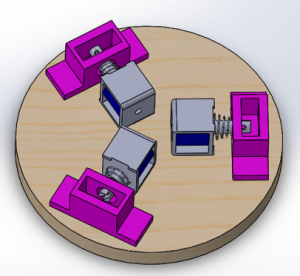 The current plan is to use “pull solenoids” that can hold the grommets of the main deployment bag in place until their intended release. 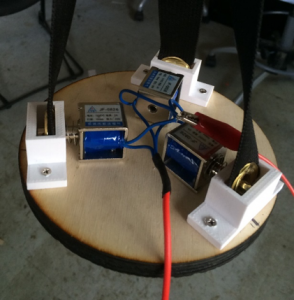 After we built the first prototype, we found that the solenoid pins were binding under shear loads on the pins. We are looking into the possibility of custom pins as well as other retention mechanisms. New pins will reduce binding in the mechanism, and alternative mechanism could eliminate the problem all together. The plan is for these new recovery systems to be tested in small scale on October 23. A full scale test flight is scheduled for thanksgiving weekend. Test results will follow.